If you are a blog owner, won’t you like to make your blog outstanding? To be honest, as a Blogger owner, I would. But it will not be outstanding without you doing anything. In the long term to run a blog, I understand that the blog with only some readable articles cannot be the most attractive while a blog with both readable articles and a personalized background can make it. A personalized background, to some degree, refers to a background designed with a unique thought and unique photos. CollageIt, an easy-to-use program, will assemble your unique photos to make a blog background reflecting your personality quickly and automatically. Before open your CollageIt program, you should prepare some classical photos first. You can download your photos online from some big websites like Flickr or use your own photos from your camera or other photo stock. However, most people would rather choose the latter than the former, because they think that the latter is tend to be more unique and meaningful. It is also true for blog owners to make the characteristic blog background. After preparing your photos, add them to the CollageIt. You can click the Page Setup and Background button in the upper left to set your collage and change your collage background respectively. What’s more, you have a few options to fine tune the appearance of your collage. In the Layout section, you can choose one collage style from the four styles including Mosaic, Grid, Center and Pile. 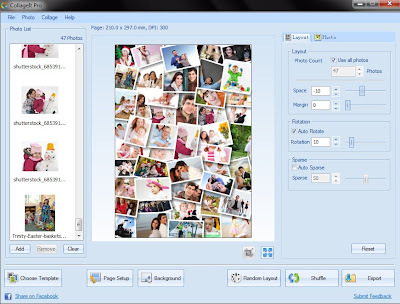 You are also able to control the individual photo number and photo Margin by setting the Layout. Meanwhile you can use Shuffle and Random Layout to change the order of the photos in the collage automatically. By doing so, a desired collage for blog background is initially formed. When you finish your collage, you can preview it in the collage and export it as image. If you think it deserves to be called a personalized image, you can upload the image and set it as your blog background to attract more visitors. In fact, you can personalize your Twitter background, Facebook background and other page backgrounds in the same way. Have you ever found the right way to create a personalized background for your blog? If you haven’t found it yet, try to find the answer from CollageIt. Welcome to share the post with the link address reserved.